The best thing about the Heritage Valley Corn Dog Festival is that I got to talk with so many great people from my district. One thing I asked them about was the attempt to President Obama and others to build a mosque at Ground Zero in New York. 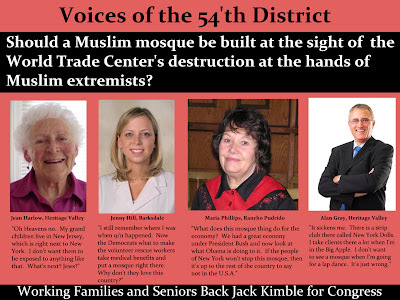 I was thrilled to see that while, people in the district were against the mosque, they weren't against Muslims. They realized that half the Muslims in this country are good people and only asked that no new Mosque be built in the same state as such a horrendous tragedy. Click on the picture below to see it full sized. I love New York Dolls.